Two ladies living in an RV full time. 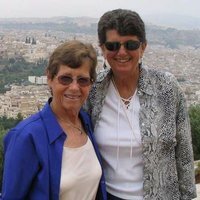 We are 2 ladies, both older than 65, who have lived in an RV full time and traveling for the last 18 years. We have raised 4 children, who are all adults now, so we also have some grandchildren. We leave the USA several times each year to travel to other countries and also do cruises. We try to boondock whenever we can. We are members of the Escapees RV Club and also have a lot at the Escapees Park of the Sierras in Coarsegold, CA. None. We have done a lot of traveling in the world, including driving our RV all over Mexico dozens of times, down to Costa Rica once, and Panama once, and all over Chile & Argentina. We have also had a camper van in Europe 5 times for long periods of time. We would be happy to help other people wanting to travel. 2005 35 foot Seabreeze LX by National RV. It has 2 slide outs. It has 2 butterflies on the front.